I can't believe it has already been two weeks since my double mastectomy. I wouldn't say it has been a smooth and easy recovery, but I guess it's not that horrible either. In fact, I am still seeing lots of blessings these past two weeks. 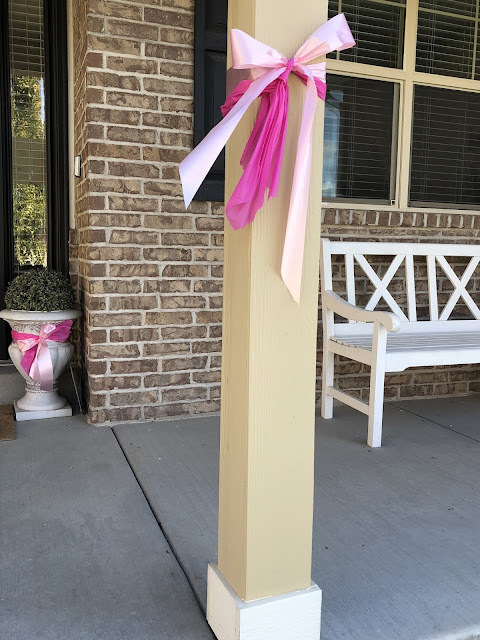 The picture I posted here with the pink ribbons are a surprise from my wonderful neighbors. I don't really know exactly who was involved, but they were not only tied to the pillars and on the mailbox of our home, they are in our entire neighborhood and streets. How amazing is that? I truly feel like I live in one of the BEST neighborhoods with the most amazing people. I had the surgery on Wednesday, we thought I could go home in a couple of days. The next day, I was having a reaction to the anesthesia, and kept throwing up all day and night. By Friday, my right breast started bleeding inside and they had to take me back to the OR. During this procedure, my blood count dropped to 14 and I had to get two units of blood. Then, the next day, my other breast started having the same issue, and starting to swell up. This time, my doctor was able to use a needle and syringe to removed the blood without taking me back to the OR. I don't have a blood disorder or anything (not that I know of! ), but the doctors were scratching their heads as to why I was having this kind of the bleeding. My suspicion is that because of throwing up so intensely for a day, put too much pressure and that caused the bleeding, but who knows. I am VERY sensitive to anesthesia and most pain meds, they always make me extremely sick and I will throw up all day. I would rather be in pain than be sick, so I don't take anything. The first couple of days after the surgery, I got Tylenol through the IV, and that is that. I am doing ok. I think some pain is expected; well, I had surgery. My condition was stable enough that I was released on the 6th day. Driving home, I was sitting in the passenger seat and reflecting on everything that happened in the last several months, the recovery ahead of me and more surgeries to come. Also, I was a little down about how my body always seems to have some problems, is unpredictable and hard to live with. Most people get surprised if I tell them I do have blue days sometimes, because I am usually a very happy person. But, this body of mine packed with medical issues tires me out sometimes... I wish I could take a receipt and exchange it for a better one. But then... 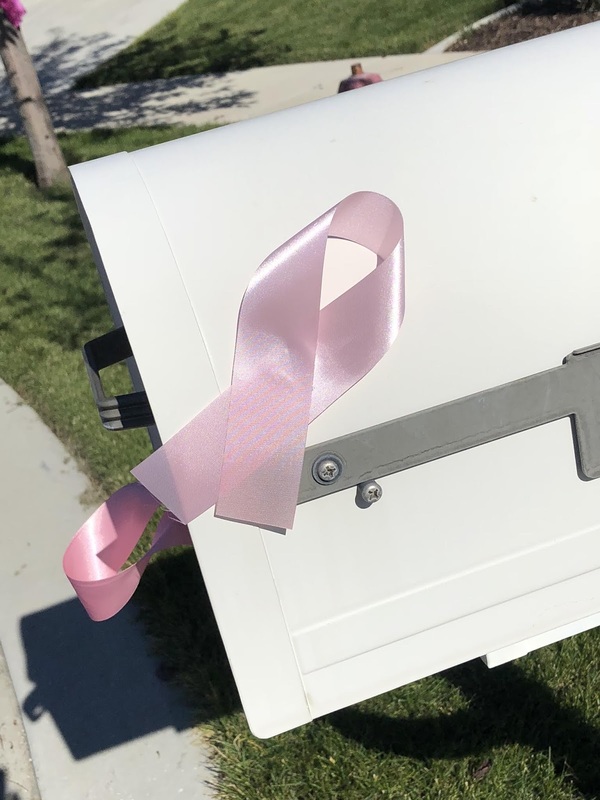 When we turned in to our neighborhood, and saw all those pink ribbons on the trees and mailboxes on both sides of the streets and cul-de-sac my eyes starting to well up and my heart was quickly turned around to see the blessings in my life. How wonderful to have a chance to live and be a part of this world. How can I live better once I am all healed up and move on from this? When I was asking this questions to myself, many people's faces came to my mind who have been a great example to me. During this new challenge in my life many people showed love and support for me. I think I know my answer already. Que você tenha uma ótima recuperação e seja bem-vinda vão lar! Beijos! Sachiko, what a rough start to your recovery you have had. How amazing that your neighbours put out all those pink ribnons. Obviously you are well thought of in your area. I pray that your recovery from now on will be plain sailing. Thank you so much for sharing with us about your journey. I have been praying for you. Welcome home, Sachiko! You have love and support and prayers even from unknown readers of your wonderful, heart-felt blog. I think of you often and send you love especially when you feel pain. God shares His love with us through you. Know that invisible hands of love are supporting your sitting up, standing, walking and then lying down again. Sending you very best wishes for a complete recovery. What you have gone through must be devastating, bu so nice to come home and see all those pink ribbons. I'm so glad for your wonderful friends and neighbors! I'm sending pink ribbon thoughts to you too. I hope you have a good healing from here on out. Love. You are incredibly one of the most amazing women! Will be praying for you in the days ahead for quick healing. I wish you all the goods and love abd health for the future ! It sounds like you are blessed with wonderful neighbors! Thanks for sharing your story. Just said a prayer for you. I've been following your blog for a while, marveling your personality, family and talents and I was devastated about your surgery but your attitude is absolutely positive and amazing and your're blessed with loving family and great neighbors, indeed! But you also are a blessing for all of them and I do believe that all this positive energy will not be lost and will transform to lighten your life! Oh my goodness, you are certainly allowed to feel down after having a double mastectomy, especially with all those complications. I am glad you are back from the hospital now and on your way to recovery. I am glad you have the support of your community. I hope that the rest of your recovery goes much more smoothly. Hello. I just happened upon your blog site. I want to wish you a very speedy and complete recovery from your surgery. 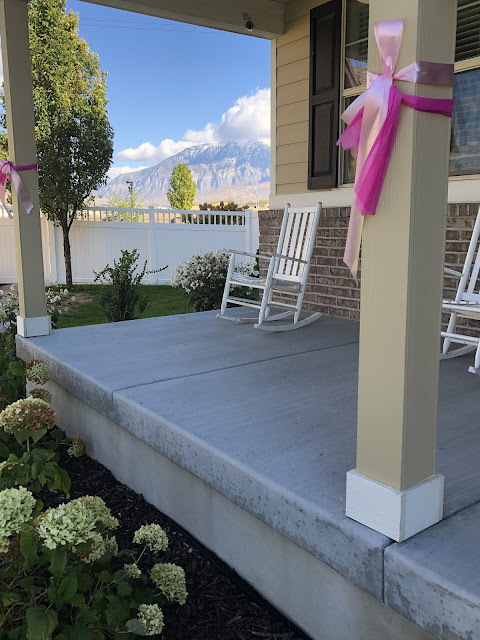 You seem to be a strong woman and I love the way your neighbors honored you with all the pink ribbons! Good Luck and God Bless You. I have been thinking of you lately, Sachiko! I am sorry you had extra complications from the surgery. I am glad you were able to come home and that you are doing better. You are such a wonderful lady and I am so glad your neighborhood is being so good to you! Take good care of yourself, and keep us posted on how you are doing.